In the early 20's and lasting until 1939, Tulsa was booming with life and money. 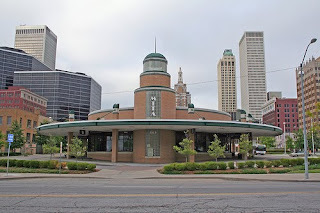 Throughout downtown Tulsa, Art Deco buildings were springing up almost overnight. Art Deco buildings were the rage in the United States, in fact, the art deco style had permeated almost every facet of civilization between the two world wars. Art Deco can best be classified as a style of art that is marked by stylized forms and geometric designs adapted to mass production. It shows the influence of Egyptian, Greek, Roman, Mayan, and Eastern design, often using shapes and streamlined contours. Often, the stile was used for hotels, theaters, and office buildings. In essence, Art Deco was a "modernization" of a great many artistic styles and themes from history. In many examples of Art Deco, one can easily detect the influence of Far and Middle Eastern design, Greek and Roman themes, and even Egyptian and Mayan influence. Modern elements included machine and automobile patterns, shapes such as stylized gears and wheels, or natural elements such as sunbursts and flowers. Between World War I and World War II, especially during the roaring twenties, Tulsa began to come into her own. The discovery of oil in the early 1900's brought a great wealth into Tulsa, causing the city to explode in a building frenzy. 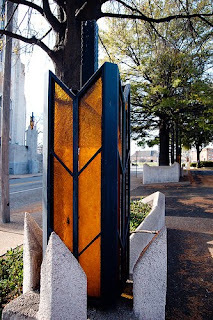 Tulsans wanted the local architecture to reflect the modern, progressive city they called home. Art Deco was an opulent style, and its lavishness is attributed to reaction to the forced self-denial imposed by World War I. There are three types of Art Deco architecture: Zigzag, classic moderne, and streamline modern. Zigzag (or stepping) architecture is used in Art Deco to make qualities of height more pronounced, and is an obvious choice for towering structures. The standard shape of the Art Deco skyscraper is that of a wide base, and as the building grows taller, narrows gradually into a stepped form until the tower extends into the sky at a consistent narrow width. This type of architecture is influenced by the pyramids of ancient civilizations. This type of architecture was highly popular during the early to mid 1920's. Classic Moderne is a type of Art Deco architecture that is identified by its graceful composition. 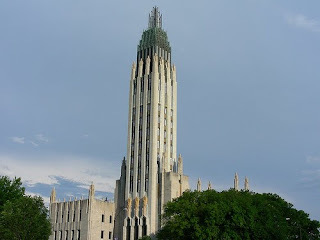 This type of architecture modifies classical architectural forms and compared to other types of Art Deco architecture, exterior and interior ornamentation is far less apparent. This form of Art Deco values symmetry, typically these buildings were more sedate in form, usually horizontally structured, except for the towers which were modeled after the traditional forms of urban skyscrapers. This typically features a variety of distinguished artwork and imagery created in a variety of mediums. Painted murals and carved statueary were meant to convey through symbols the purpose of the building and its position in the community. This type of architecture was popular after the stock market crash of 1929. Streamline moderne is a type of Art Deco architecture that appears to be the most modern of the three Art Deco architectural types. It is is easily identified through the styles clean, smooth lines which convey aerodynamic qualities. Typically, they are box-like in appearance and have flat roofs. During the 1930’s, when this type of architecture was prevalent, streamlined moderne provided a relief from the heavier ornamental look of the previous two styles of Art Deco architecture. This type of architecture looked thoroughly cutting edge with the use of glass bricks, speed stripes and alternative windows, with some looking like the portholes of an ocean liner.